For the final installment from Adria I've prepared some of my favorite images from the night race. 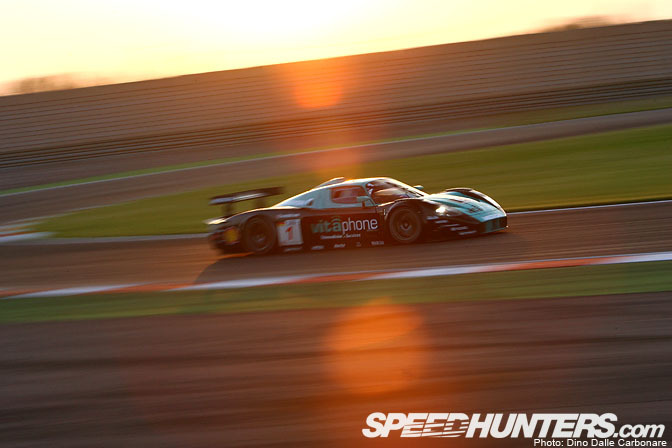 Within the first few laps from the rolling start the already low sun quickly set behind the horizon, and the circuit's illumination was flicked on. 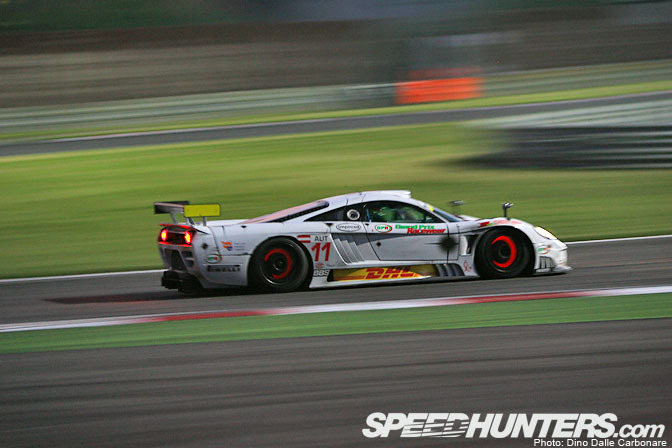 It didn't take long for the GT1 cars to pull away from the slightly slower GT2 class, leaving a second tightly packed group fighting fiercely for the lead. …while Andrea was pulling away from everyone else up front. 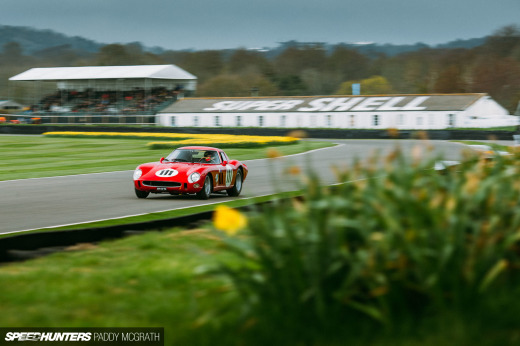 Biagi was struggling to get the best out of the Matech GT40, which is still nowhere near its real potential. 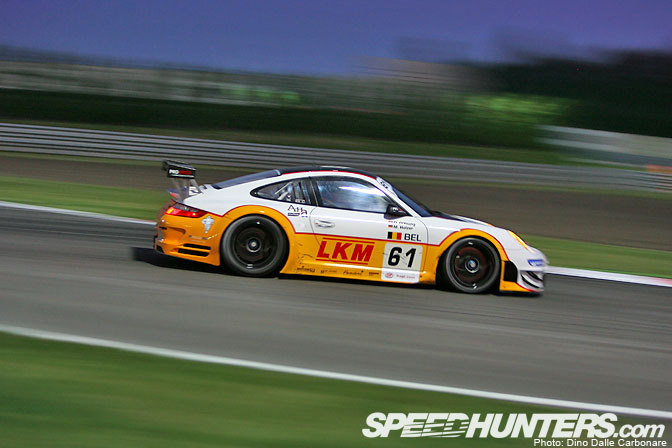 He ended up crossing the finish line in 19th position in the middle of the GT2 field. 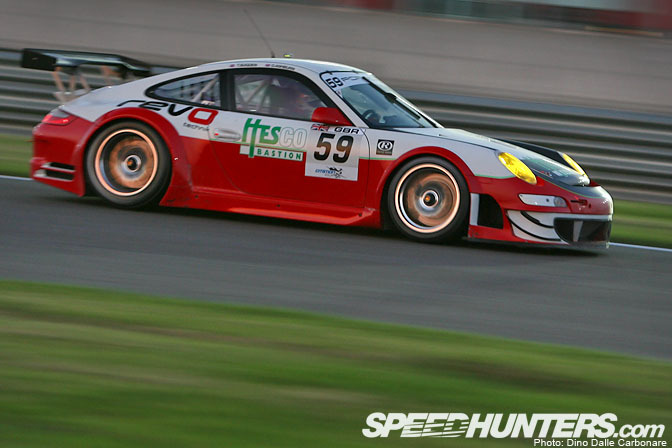 The Porsche of Holzer and O'Young came in in 4th position in the GT2 class, 10th overall. 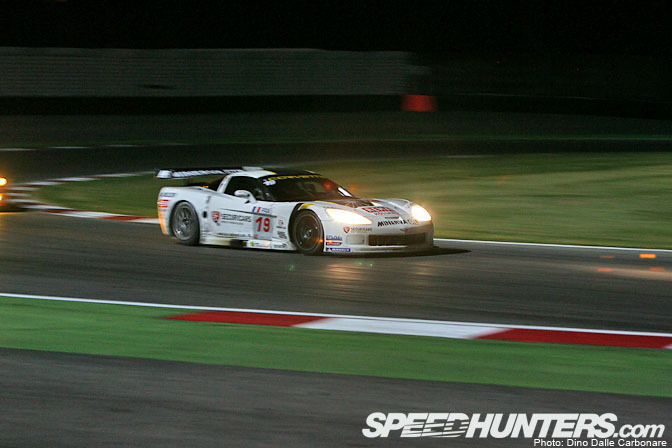 The car looked stunning under the floodlights. As I did during the practice session the day before, I began "backfire-hunting," something that proved to be quite hard. Those explosions literally happen in a split second and if you see them through the viewfinders as you burst a bunch of shots it means you've missed them. I got lucky with the PK-Carsport Z06, check out that flame as the driver downshifts down the gearbox hard on the brakes before the in-field chicane. 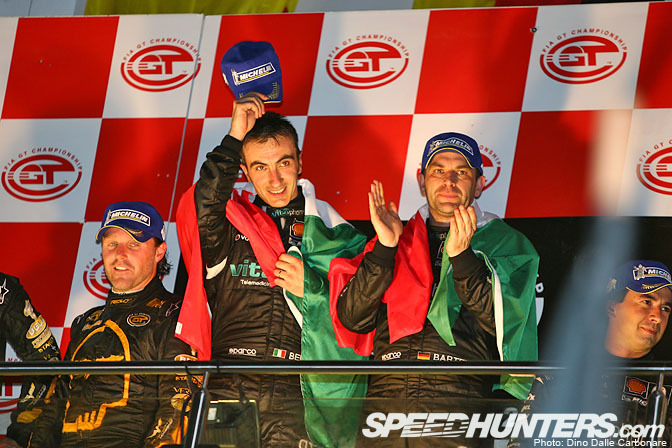 Kumpen and Hezenmans finished in second position, 10 seconds behind Andrea Bertolini and Michael Bartels. 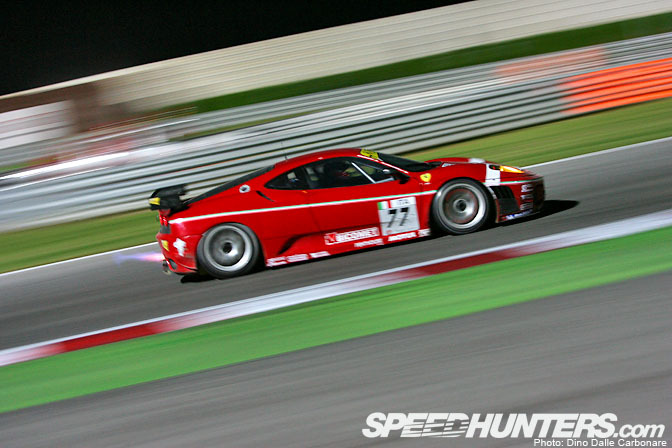 I was beginning to think the Ferrari's were running an afterburner system back there, that flame must be a good 50 cm long! 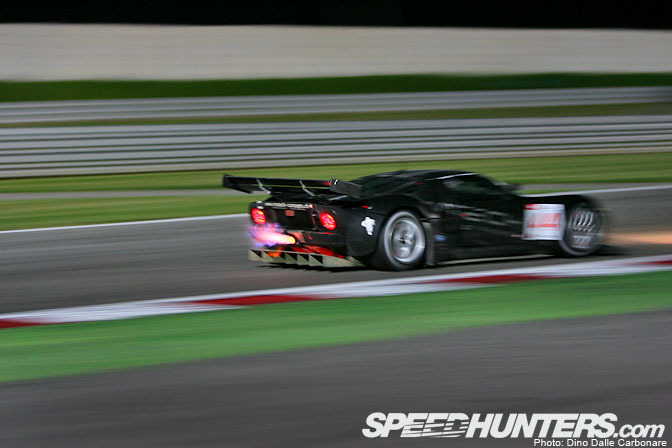 But like I mentioned, it was the Matech GT40 that had everyone beat in the pyrotechnic display, the flames being followed by almighty bangs. I'm sure the camera crew got some good footage on the Red Cameras, as that location they are shooting from was one of the best to see big flames. 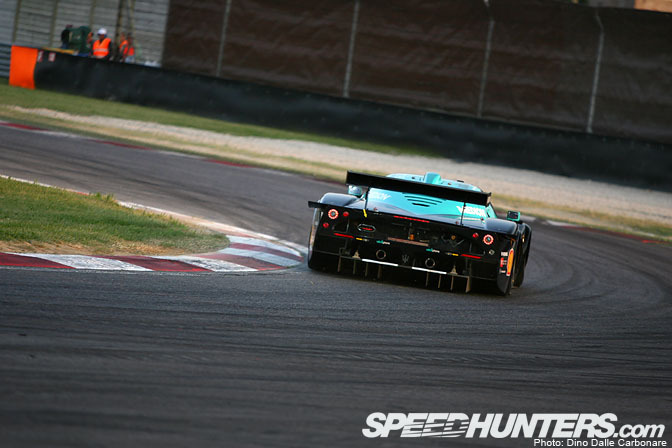 The C6R of Maassen and Moreau finished the race in in 4th position behind the n.2 Vitaphone Maserati of Muller and Ramos. Shooting at night is really cool as you get to notice some pretty crazy stuff. 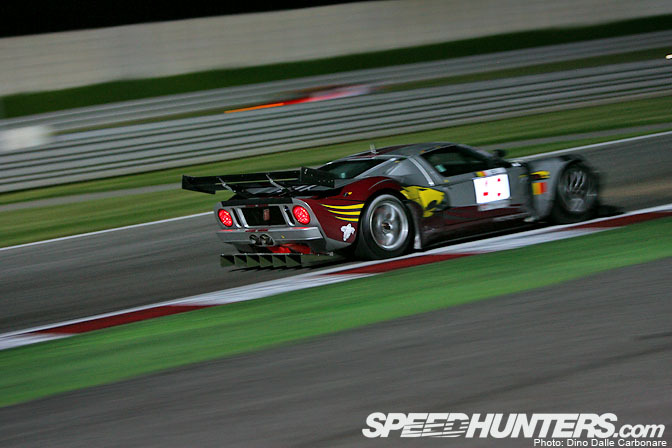 Just check out the red-hot exhausts on the MarcVDS Racing GT40. 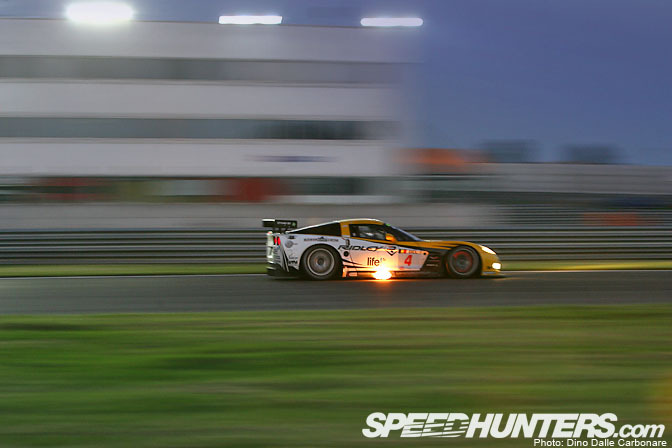 I was waiting patiently to get a nice shot of the n.3 Salleslagh Racing Z06, but it proved very difficult as it wouldn't shoot out flames as regularly as the others. 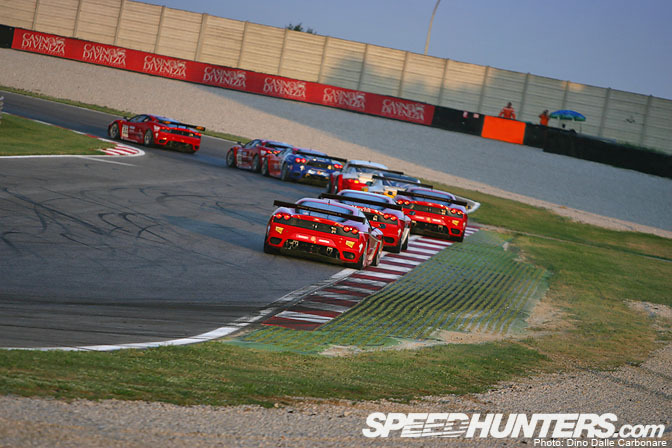 As the 2-hour race developed the field began to spread out wide, and I noticed that compared to the GT3 and GT4 classes there is very little overtaking action. 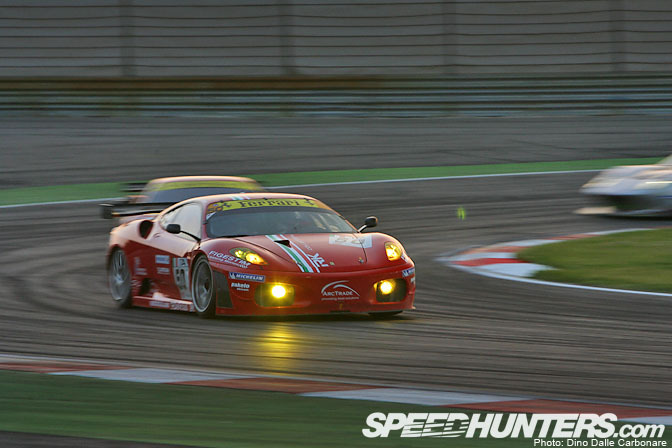 The Brit Trackspeed Team crossed the finish line in 8th position in the GT2 class, 15th overall. I know I've been going on about the American V8s, but the Porsches sounded great out at Adria too, their opposed engines producing one of the most recognizable notes in the car world. There you go, I finally got a little bit of a fire from that Vette! 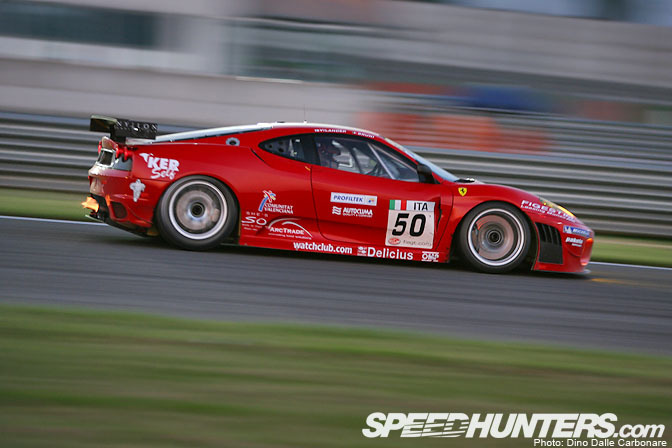 I didn't like how the F430 looked with the big rear wing, but I guess they are not there for looks. 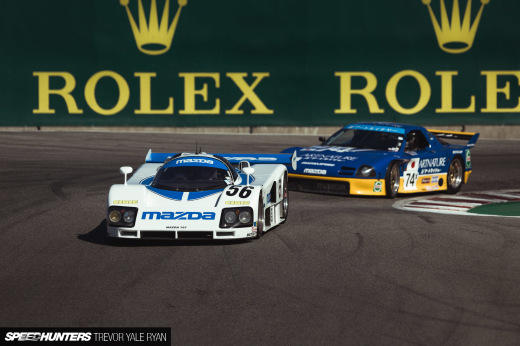 The n.1 MC12 driving back into the pits at the end of the race with the n.4 Vette right behind. 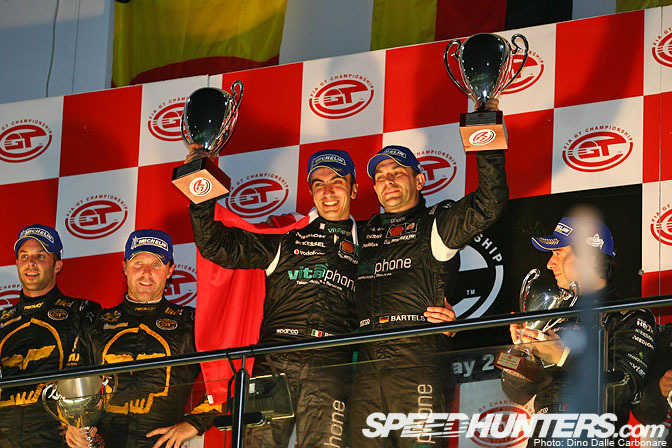 Two races and two wins for Andrea Bertolini and Bartels, who both came out on the podium with Italian flags around their shoulders. 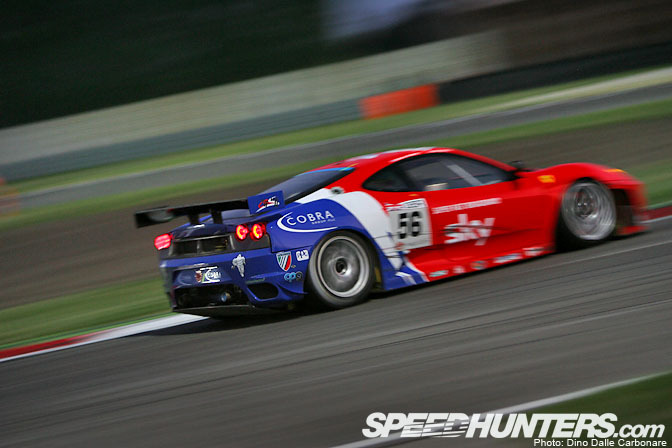 The season is going perfectly so far for the Vitaphone team, now with 24 points in the bag, 9 above K plus K Motorsport that runs the silver/red Saleens. What would a podium celebration be without a nice champagne shower. I hope you guys enjoyed the coverage from Adria, I know I had a great time shooting and covering such a great series. I hope next time I'm at a FIA GT event I will get to see the Nissan Motorsport R35 GT-R GT1!! Desktop of the 10th picture PLEASE!!! Nice work Dino, sunset is always a good time for photography but then when it gets dark its a nightmare! Wow insanely awesome coverage Dino, I know someone is going to say it so I might as well but we need dektops! 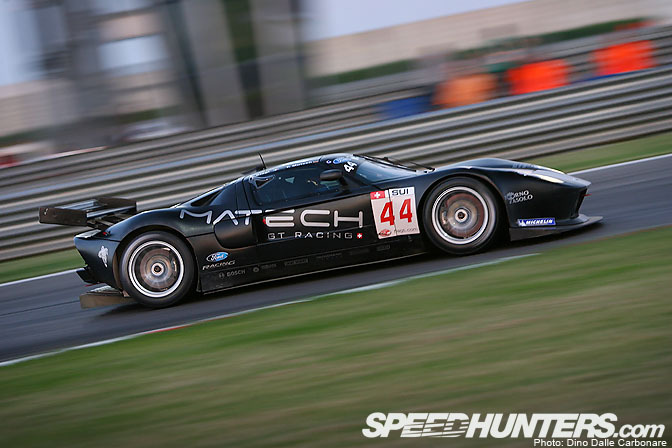 Your photos are too baller to be compressed; but my top picks are def the MC12 first photo, Matech flame pic, and the S7 picture with all the brakes lit up. Great Work! Those are some fantastic images!! Awesome. You should give us the original (probably very high) resolution images. 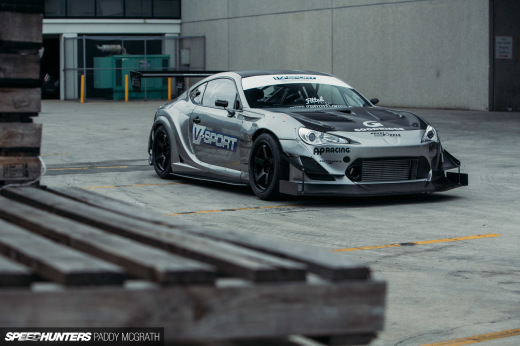 Awesome shots! I absolutely love backfires and red-hot exhausts!